Last night, as I rode through Stevens Point’s recently redesigned downtown square, I noticed that additional bicycle parking had been added. 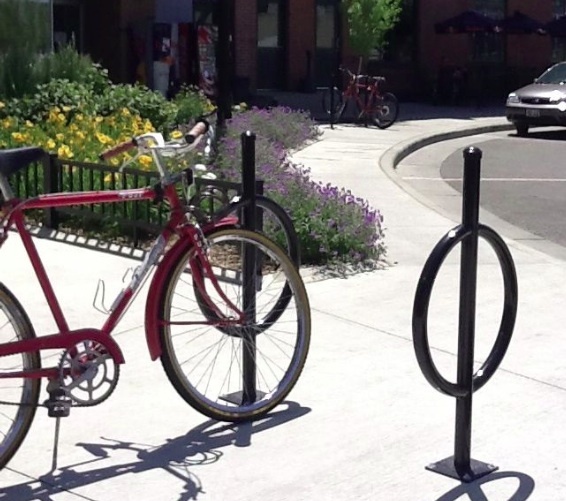 As part of the reconfiguration of the Mathias Mitchell Public Square last summer, the city had originally installed 4 hoop-and-post racks for bicycle parking. These are excellent structures for securely locking bicycles, conveniently allowing the frame and front wheel to be secured using a U-lock. Since each hoop-and-post permits 2 bicycles to be locked to it – one on either side – the installed bicycle parking could hold 8 bicycles. Although I was pleased to see the choice of a quality design for the new bicycle racks last summer, I was simultaneously dismayed that more bicycle parking hadn’t been installed. I recall a few times when my quick count while taking a lap around the new square found around 20-30 bicycles parked, most locked to other structures on the square. Racks totaling a capacity of 8 bicycles were clearly insufficient. And that is why I was so excited to see 8 newly installed hoop-and-post racks last night, bringing the total number of racks to 12 with a capacity of 24 bikes. In the northwest corner where 2 racks were originally installed, there are now 4. The same holds for the northeast corner. And to the north, on the west side of Second St. where no racks had been installed last summer, there are now 4. Although the addition of these new racks is appreciated, it is unfortunate that the south side of the downtown square still has no bicycle parking. Based on where bikes can be found locked to other structures, the need for bicycle parking on that side of the square is apparent. 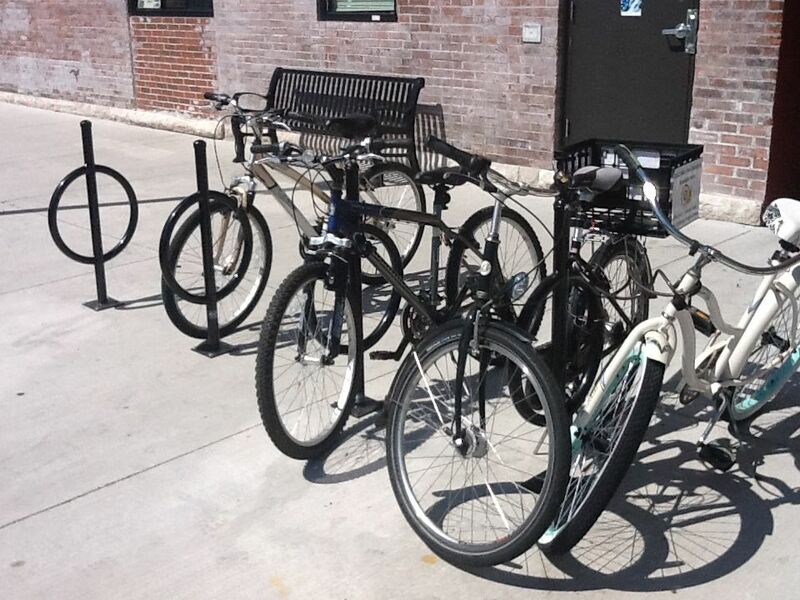 South side: Where’s our bike parking? Nevertheless, this trend of adding bicycle parking is welcome and I hope it continues. One factor that discourages growth in bicycle use is the lack of quality parking in convenient places. The converse is also true: if infrastructure is built that makes bicycling convenient, then the number of people who choose to use a bicycle for their errands increases. 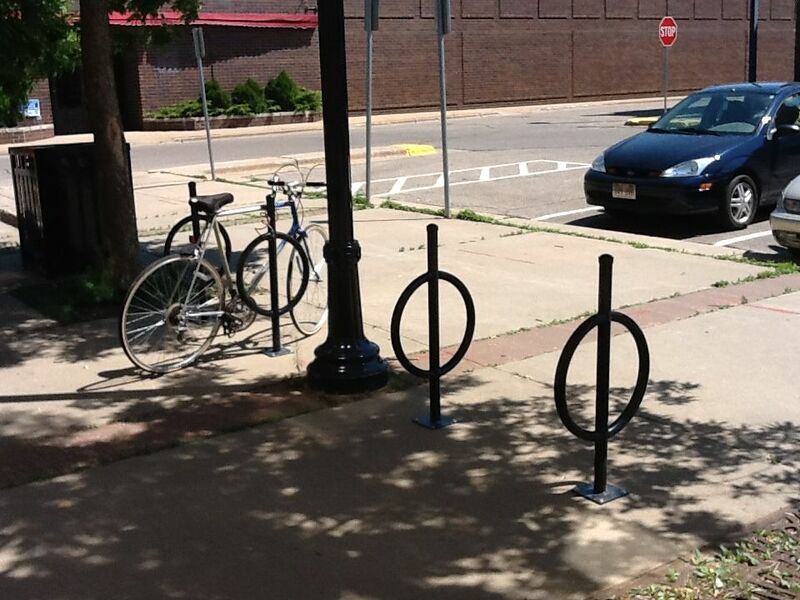 Thank you, Stevens Point, for your continuing efforts to improve the bicycle infrastructure in our city. 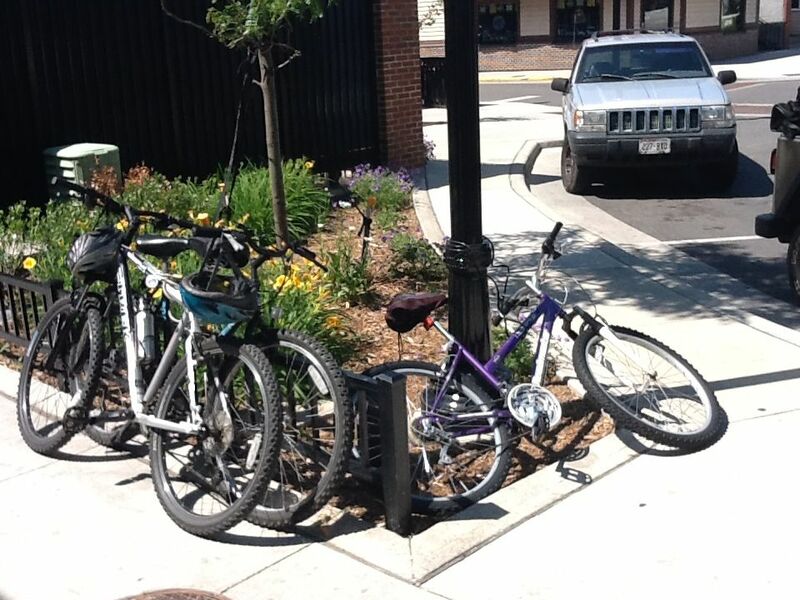 This additional downtown bike parking is another step towards making Stevens Point an even better place to live.